Cambridge student, Stefanie had some great suggestions for our Orientation with new students. Stefanie has created a document, which we will now put it in every orientation pack. 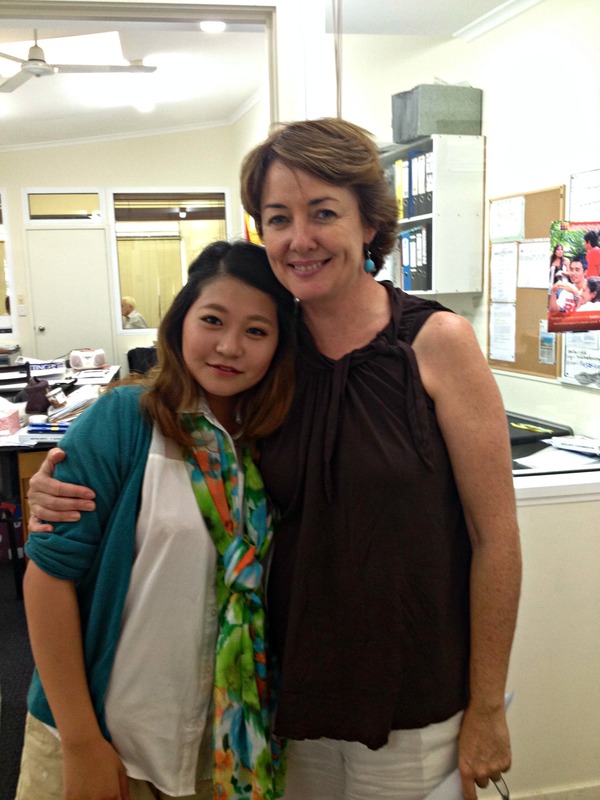 Previous Lexis Noosa student, Azusa Kurogi visited today and had a catch up with her teacher Michelle. 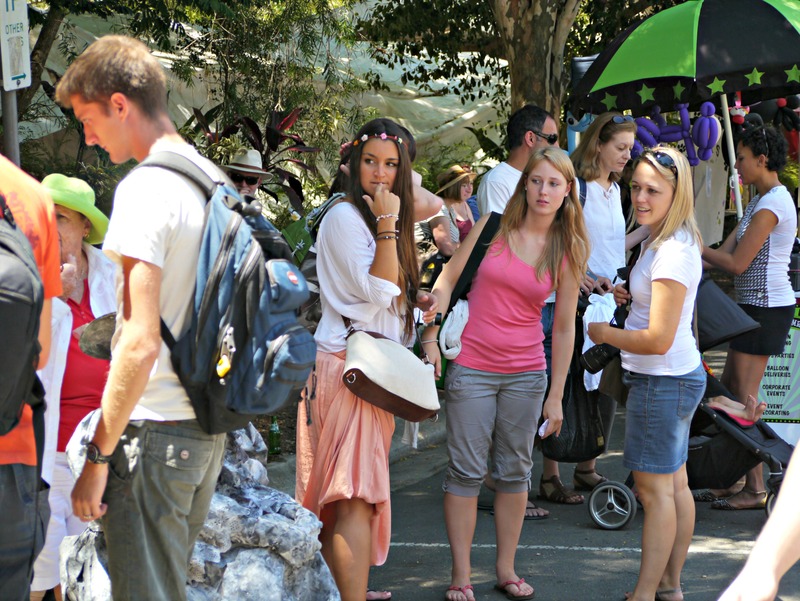 CAE student reviews an excursion to the Eumundi Markets! This is a report by Cambridge CAE student, Marco on a visit to the Eumundi Markets. “A long time ago a small number of backpackers travelled through the wide country of Australia. Life was hard and there were no Greyhound buses. However, deep in the wild hinterland of Noosa, at a place called ‘Eumundi’, they were able to recharge their energy with ‘spiritual materials’. Of course everything was handmade by the inhabitants of the tiny town and nobody could disturb the peace here, as long as they had their ‘illicit’ substances, everything in life was alright, or so I was told. Today, Eumundi is a famous tourist attraction, because of this market. Thousands of people rush through the passages between the countless numbers of stalls. People can find many things there, which look especially beautiful or spiritual. Actually, to be honest, most of these gadgets you don’t really need for life. So what makes this place so unique? The whole market seems very old-fashioned. Also the buildings of the town make it appear like an old ‘Wild West’ town. Furthermore, the architecture of the stores has remained very traditional. The area has a comfortable atmosphere, as there are lots of pretty palms between the path ways. Finally, the store holders are very friendly and relaxed, which is common with people in Australia. One of these people, Roger has been playing Aboriginal music at the market for over twenty years. He is also called ‘the voice of Eumundi’. He has three children and lives in a bus. As matter of fact, the market is split up into two parts. The historical centre offers visitors handmade things, whereas the so called ‘suburbs’ sell and trade Asian goods, which does not really fit with the market’s original philosophy. One guy from the modern part, who has been working there for fifteen years told me how unexpectedly easy it is to earn a living here. I wondered how he earns his livelihood selling three-dollar armbands. I think every store holder is part of a community in which all members share their profit, so there is no drawback for anybody. Apart from that, there is a great food corner too. It is impossible to walk through these market corridors without buying a small snack, because the fantastic smell navigates you to the right place automatically. 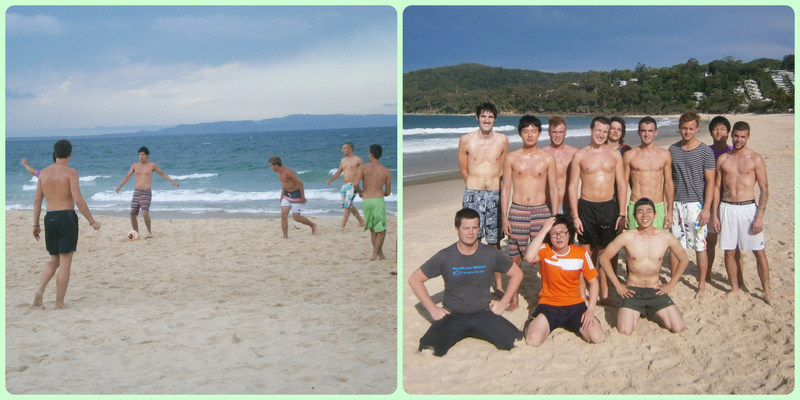 Beach Football and Cricket activities are fun. The best part about it is jumping in the sea after too cool off! Must have own ABN and be available for school holidays and weekends. Locale Restaurant & bar required experienced and professional floor staff. Generous Hotel penalty rates apply. Experienced in holiday resort housekeeping. Approximately 35 hours per week, including weekends on a roster system. Award rates apply. Experience preferred, no weekend work, two days per week. ABN is required. Students hit the books at Shades cafe and wine bar, while soaking up some lovely summer sunshine! Our Cambridge examination students are taking their speaking exams today. 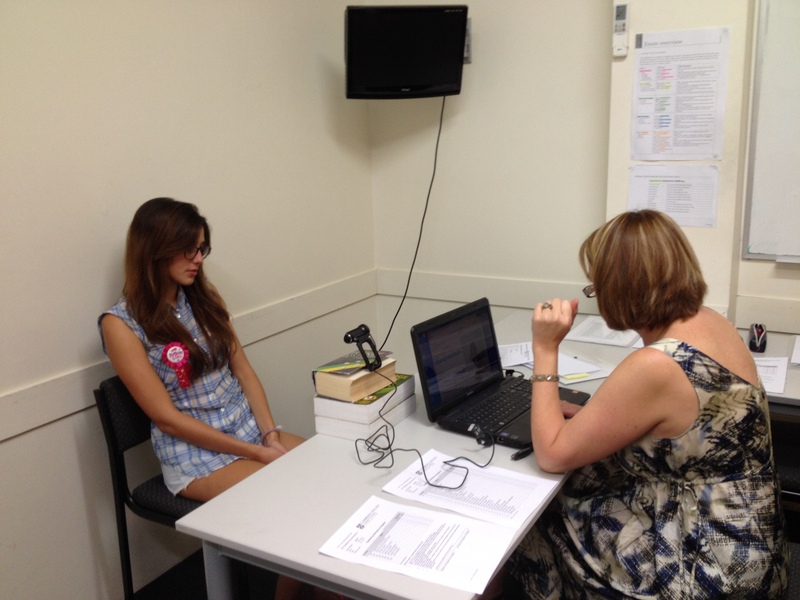 Cambridge Exams Manager Nina Schiller is busy taking exam day photos. Meanwhile, teacher Sonia Russell waits with candidates and ensures that all the pre examination paperwork is correct. Everyone looks relaxed and happy. It is good to have the exams here at our school. 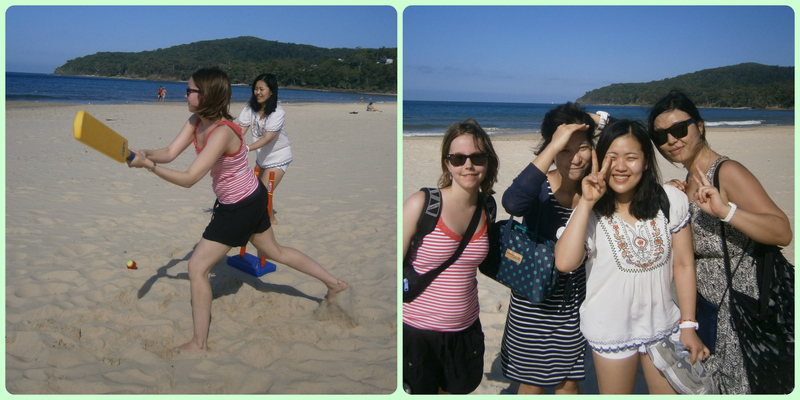 Past student Mirai visits Lexis Noosa! It is always exciting to welcome past students back to the campus after they finish their courses! 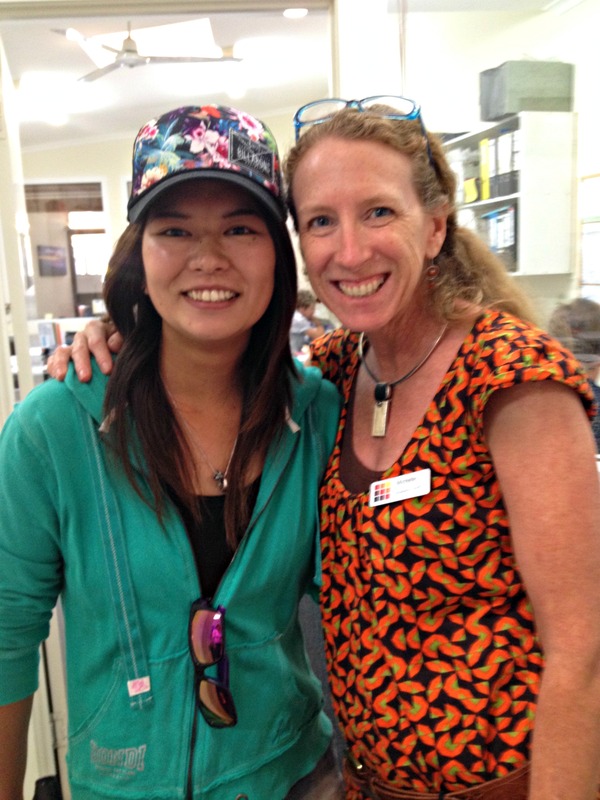 Mirai Sato returned to Lexis Noosa for a visit and catch up with teacher Kerri. Meet Charifa and Billy Joel, our best ever cleaning team. Italians, Charifa and husband Antonio chose to study at Lexis for their honeymoon. Now Antonio is working in a restaurant in the evenings and Charifa has joined our student cleaning team. Peruvian Billy Joel, completed his English courses and is now studying horticulture at TAFE. He recently replanted all the college gardens which are looking beautiful. Billy and Charifa are keeping our school sparkling clean, thank you guys! What does it take to be a successful accommodation officer? The skills of a hotel manager, student counsellor, court mediator, logistics director all combined with a s ense of humour and lots of patience. These three Ladies have it all. Homestay Manager, Jo Porter has run the department for the last 6 years, overseeing over 1600 providers with 500 families currently hosting. She loves a joke and we can hear her laughter all around the office. 6 am on a Sunday morning you will find her walking her dog on one of our beautiful beaches. 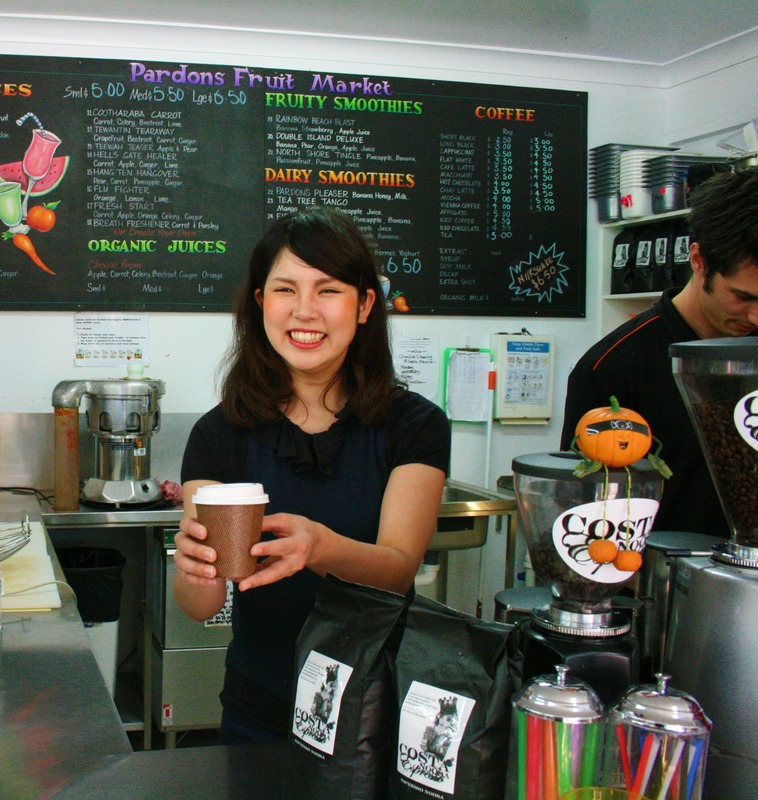 After backpacking around Australia, Cath and her family settled in Noosa and wouldn’t live anywhere else. Her daughter Lilly is a talented dancer and her youngest son Ethan is a gifted surfer, so you will usually find Cath chasing the waves at the weekends. She meets all our students, as she covers both reception and homestay duties and everyone appreciates her gentle caring manner. Lori Rayner grew up in Naroom, a picturesque seaside town in southern New South Wales. As well as host family placements, Lori is responsible for our student houses. Maybe this is why she enjoys her Friday sunset cocktails so much? At the weekends you will find her enjoying the quiet peace of our National Park. – Locale Restaurant & Bar (new Italian restaurant, Hastings St), requires experienced / professional floor staff. Send resume to info@localenoosa.com.au, or apply in person at 52 Hastings st, Noosa Heads. – Au Pair in Doonan. For short term live in, until mid-January 2014. Experience preferred, please call or SMS to 0420 482 900. – Cleaners required for holiday letting in Noosa Heads. A warm, Noosa welcome to our new students! The Intermediate students and teachers took their classrooms outside and went to the Eumundi Markets for some serious people watching and describing. Teacher Fiona explained the task at hand and then students wandered around with cameras and task sheets to find some real “characters” to describe. Our wonderful Cambridge classes doing a speaking activity! Today’s Swiss Cooking class was hosted by the lovely Swiss girls, Jessica and Jasmine who decided on making their favourite traditional Swiss dish, Aelplermaggronen. As the groups of students gathered around the table, the girls demonstrated how to prepare and cook their chosen dish. There were a great mix of students in the class, some even Swiss themselves (Manuel,Julien,Anne), cooking and enjoy their time with one another. The students and myself all enjoyed the dish, finishing off the whole entire pot that we cooked! Thanks girls, what a great dish!! Next time Belgium Cooking…. We are looking for an experienced house cleaner for the Black Mountain area. Our Lexis Second Session started today and these lucky students got to make the most of Noosa’s glorious morning beach weather. The Lexis Second Session allows students to surf, relax or take advantage of the high demand for resort cleaners in the mornings Students join the program at 1 pm and study on until 6.45 pm. Alex enjoying the class despite his sunburnt face. What do the students get up to after class??? Iku and Alicia play the cups game! Looks like lots of fun!!! Changing the face for men’s health, we have the support by two French students, Pierre and Peter, in raising awareness for Prostate Cancer for Movember. For some reason French guys can always pull off a good Moe!! Lexis Noosa teachers in PD Session! Dave Fox, our senior teacher at Maroochydore is an accredited CELTA trainer. The teachers there have been very enthusiastic about his Personal Development sessions and it is a full house every time. 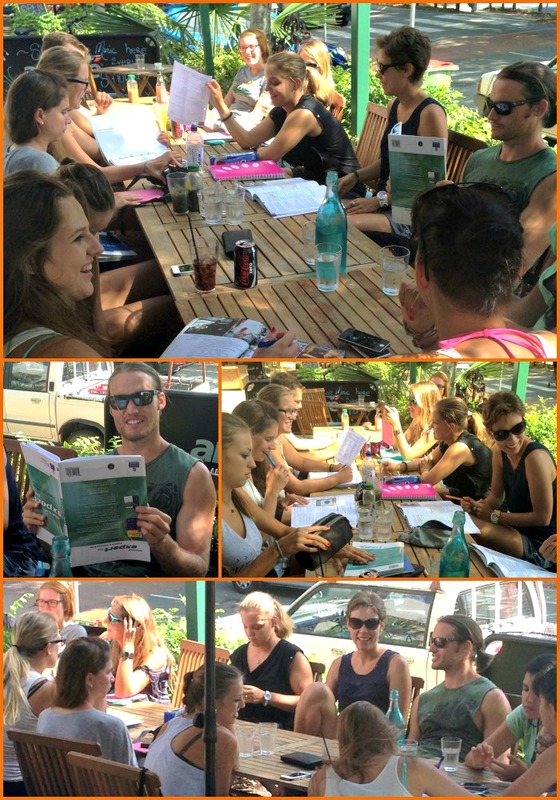 Dave kindly agreed to come to Lexis Noosa and give us a PD session on presenting grammar and it was hilarious! 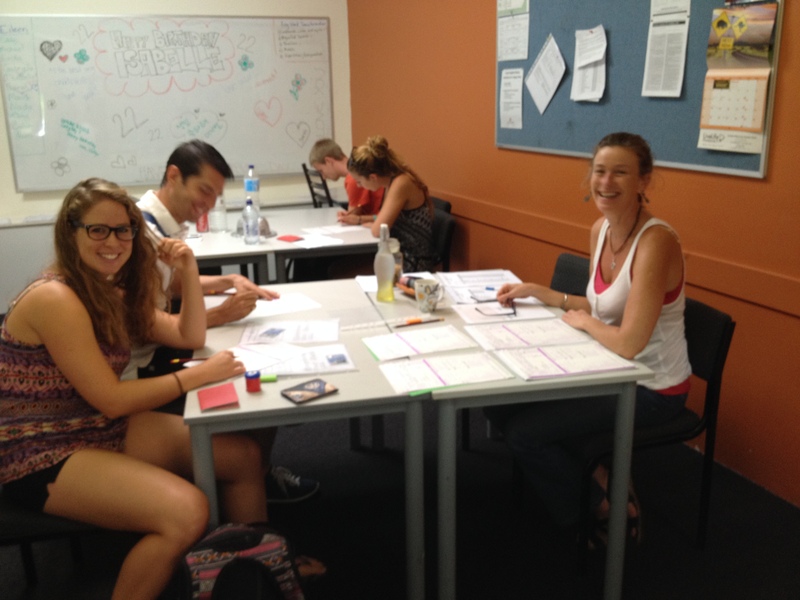 Our teachers are pictured here doing a vocabulary matching task. Thank you Dave for the great teacher PD you gave us! Today Lexis English stretched and bent themselves silly with some yoga action courtesy of the delightful Anj. build up the muscles required for our students to become excellent surfers. Saad showed everyone his moves, which included standing on his head. 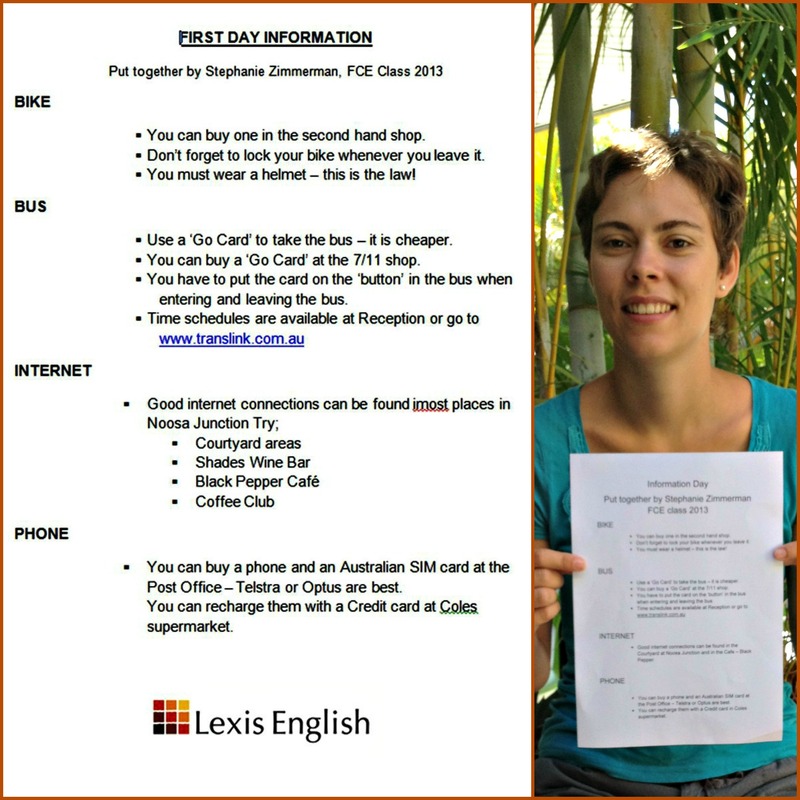 The Lexis English Registration team is based at our Noosa campus. 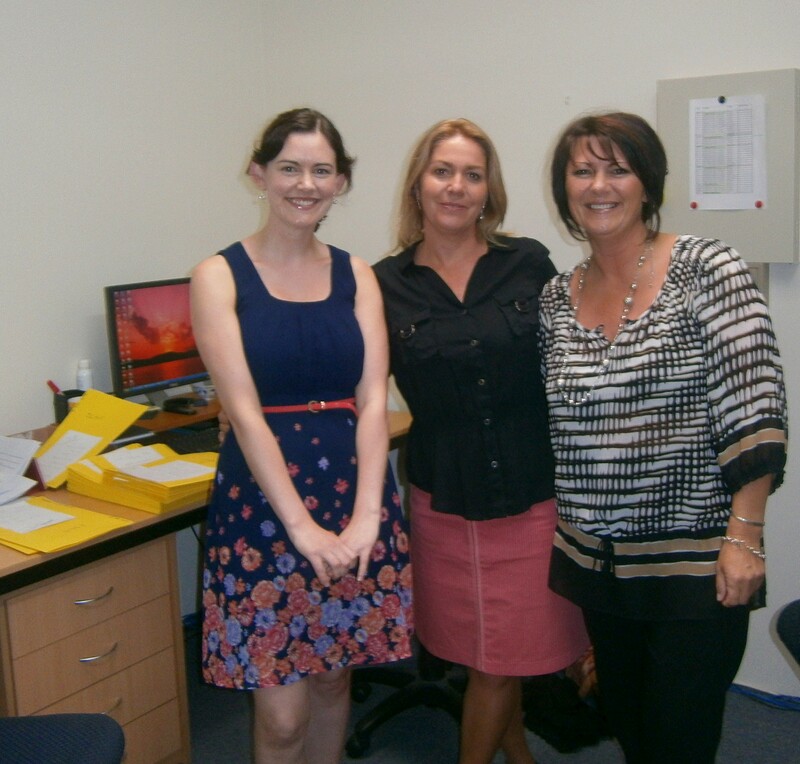 These three talented ladies process hundreds of enrolments each week for our five Australian and one Korean school, all within a guaranteed 24 hour response time. An accomplished musician, Katy has toured Europe with a band. Liz is our IT guru and a keen runner who recently completed a half marathon. Lindsay is also our Administration Supervisor and the mother of a beautiful 2 year old daughter called Laila. Teacher David and Teacher Nat are doing their best to show their support for Movember and raising aware and funds for Prostate Cancer…Only day 11…. and looking great guys!! A big welcome to the new students who have arrived today! I hope you all enjoy your time here in Noosa!!! It was the table tennis tournament championships of Lexis Noosa on Friday, where the table tennis enthusiasts went head to head in an attempt to win the Lexis Noosa Title. There were some unbelievable players this month, which indicates a lot of practice time in-between classes. After some tough rounds, it was Marlon VS Marcos and Remo Vs Pascal in the Semi Finals. An awesome performance from both Pascal and Marcos saw their opposition eliminated, this meant facing each other in the finals. Never before have I seen such a close match between two fierce competitors. Some were even saying it was the most exhilarating finals of the year. After a tough match, there could only be one winner….so the new Lexis Noosa Table Tennis Champion is…. PASCAL!!!! I am a very proud to say I am the coach of the Noosa Lexis Soccer Team! Our performance against the Maroochydore side reflected what a great positive team we have through their team work, positive attitudes, and respect they gave to the referee, themselves and others. It was a tough game and after half time we were ahead 3-1 thanks to some great goals by Jeremia, and Pascal but also fantastic team work from the midfield and forwards including Dominic, Marlo, Maxence and Saad! The defence did an amazing job also, keeping the ball out from Maroochydore attacking half with some great work from Christina, Saad, Aiden, and Markus. Even though the second half didn’t go our way, there were some amazing saves from our Goal Keeper, Chris. Thank you also to our cheer squad for coming down and shaking those pom poms in support of the Noosa side. Lexis Noosa student, Antonio making pizzas at ‘Locale’ in Hastings Street!